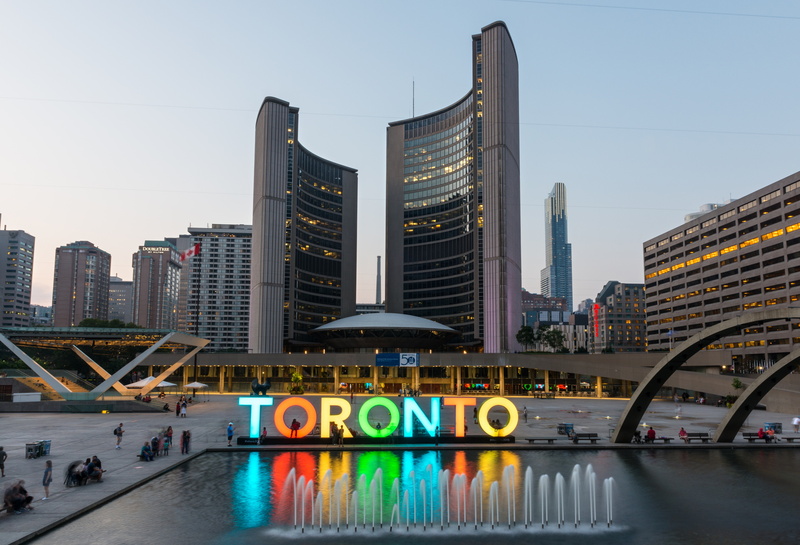 Toronto is a cultural melting pot featuring plenty of industrial and Victorian architecture, with warehouses converted into art and design galleries, artists’ studios and coffeeshops, cultural hubs of fashion and film and plenty of space for museums, too. The Royal Ontario Museum has decided to update, commissioning the studio of architect Daniel Libeskind to build an extension on its new space known as Michael Lee-Chin Crystal. The name comes from the five intersecting volumes of the building, that look like crystals; two of these crystals, containing the gallery, intersect to form the empty space known as Spirit House, a big foyer rising from the basement level to the fourth floor with bridges crossing it at various levels. Another crystal contains the so-called “Stair of Wonders” providing vertical links. The building has a steel frame covered with aluminium and glass. The original art gallery building, constructed in 1918 and repeatedly renovated over the years, has been expanded and modernised by architect Frank Gehry, who has restored a single main entrance, centralising all the commercial functions in a single zone along the end of the building. Mad’s Absolute Towers are a new landmark in a city suburb, a signal underlining the importance of the relationship between the new inhabitants of the suburbs and the big city. The architects of Mad say that “in place of the simple, functional logic of modernism, our design expresses the complex and multiple needs of contemporary society”. What makes the two towers so unusual is not their height, but their curved shape appearing to defy the laws of physics: the two buildings seem to touch each other, creating a figure in motion that residents have nicknamed the Marilyn Monroe towers. Unlike the stereotype of the skyscraper with flat walls, the Absolute Towers have a continuous balcony winding around the two buildings, so that all the apartments face the outside. 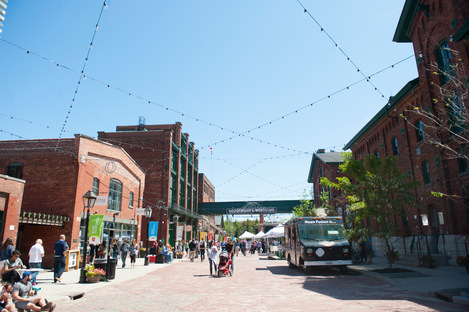 The Distillery District is North America’s biggest complex of Victorian industrial architecture, containing more than 40 historic buildings, including the former Gooderham and Worth Distillery. Old warehouses on five hectares of land have been converted into art and design galleries, architectural studios, coffeeshops and popular nightclubs. The district has been designated a National Historic Site of Canada. The building inaugurated in 1965 replaced the Old City Hall with curved twin towers of different heights facing onto a public plaza containing a pool of water. The base of the building is rectangular, and its outer surfaces are covered with ribbed concrete. From above, the building looks like a giant eye, hence the nickname The Eye of Government. The design of the public space in front of the new city hall is unusual, with a pool of water reflecting the plaza, the concrete arches, the fountain, and the walkways, all on the basis of an original Modernist design. Completed in 1977, this shopping mall in the city centre is one of Toronto’s biggest attractions, averaging a million visitors every week. The first plans for a shopping centre in the area date back to the early '60s, but the complex was not built until more than ten years later, opening its doors in 1977 with 93,000 square metres of retail space. The mall has been repeatedly expanded and renovated, growing to its present size of 160,000 square metres. Architect Eberhard Zeidler, in charge of the project, admits that the central gallery with its glass vault pays homage to Galleria Vittorio Emanuele in Milan. Our architectural itinerary for Toronto must necessarily include a panoramic view of the city from the top of the 553 metre CN Tower with its revolving restaurant. And of course a stop at the former Power Plant in the Harbourfront Centre, one of Toronto’s most important galleries of the visual arts, as well as a day wandering about the streets of Cabbagetown, home to North America’s biggest collection of Victorian homes. Renzo Piano won the competition for the construction of the new Toronto Courthouse in partnership with Norr Architects & Engineer. Piano’s first project in Canada, the new courthouse will be located in the city centre and contain a number of courtrooms that are currently spread about in various parts of the city. The project is due to be completed by 2022, and will aim to save energy and water, reduce CO2 emissions and optimise the quality of the indoor environment. The entire structure will be inspired by the concept of transparency, underlining the importance of public space. The project centres around a dramatic entrance foyer with a twenty-metre high panel of glass which lets daylight into the building, ideally connects the outdoors with the indoors, and “creates an immediate and strong image which will extend the public realm into the building, as well as expressing the public nature of the courthouse within the city.” The project aims to achieve voluntary Leed certification at the Silver level.